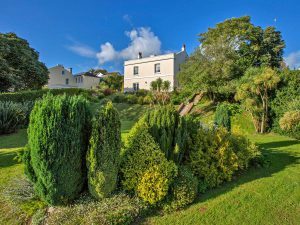 Braganza is one of our Torquay sea view cottages. It has four bedrooms and four ensuite bathrooms and can sleep up to 10 people. It also has a hot tub. We have just returned from a very needed and very enjoyable fortnight in Torquay. We stayed in a lovely detached property which enjoyed amazing views across the ocean and had lovely gardens. We wanted something top end and this house was certainly luxurious: just what we were looking for. We booked through Karen Durant from Holidays4u.org. Although we noticed that this house was on a few different websites, we preferred to book through Karen as we have used her before. She is reliable and efficient and her prices were the same as the other websites. The accommodation was very clean on arrival and the kitchen very well equipped. It had all the usual appliances you would expect such as a dishwasher and washing machine, but also an Aga which was absolutely great. The owners had left us a welcome pack, which included water, tea, coffee, wine and even dishwasher tabs, washing up liquid, toilet rolls and bin liners, to name just a few essential items. The location was very good, especially for the views, but also we found restaurants, pubs and shops within 500 yards. We thoroughly enjoyed using the games room, which had a snooker table. We have a snooker table at home as well, and we often play a game in the evening before dinner. So it felt like home from home. We were very lucky with the weather which was fine and sunny every day. This was great as it meant we could make use of the hot tub outside. This house really does have a lot of extra luxury items. This entry was posted in Devon Cottages and tagged #devoncottages, #holidays4uorg, #karendurant, #torquaycottages by holidays4u. Bookmark the permalink.